The illustration on the front of this advert was done by John Everett Millais. One of the best known and most prolific Victorian illustrators, his style chimed with the contemporary taste for anecdotal or sentimental art. His subjects were often fashionable ladies, young children or lovers. Millais contributed to a vast number number of books, magazines and newspapers, and gained a lot of his influence through ubiquity as much as his talent. 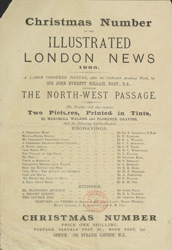 Hiring such a prominent illustrator, as the 'Illustrated London News' has done here, would have encouraged many more people to buy the paper.